With thanks to Kurumba for hosting Groomed & Glossy for this review. All words and opinion are our own. 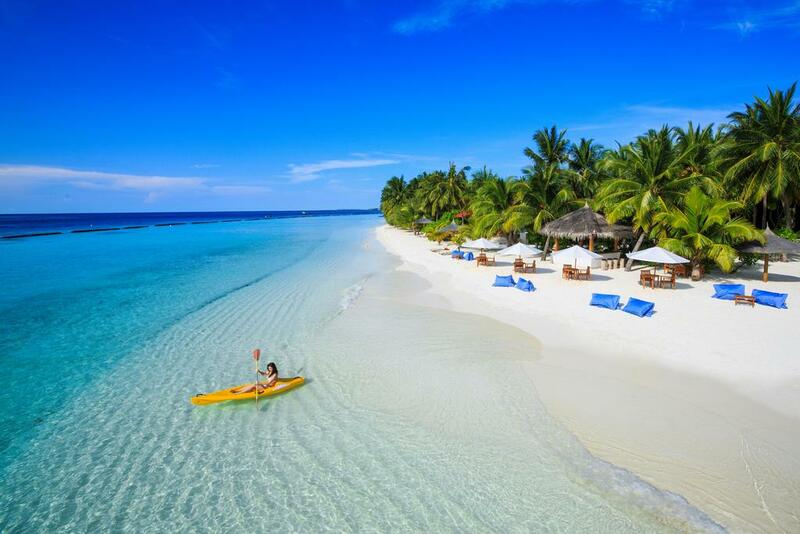 The picturesque resort of Kurumba was created in 1972 and was the first tourist islands where two visionaries had an aim to introduce tourism to the Maldives, wanting to create that ultimate holiday destination, incorporating water sports and game fishing initially. 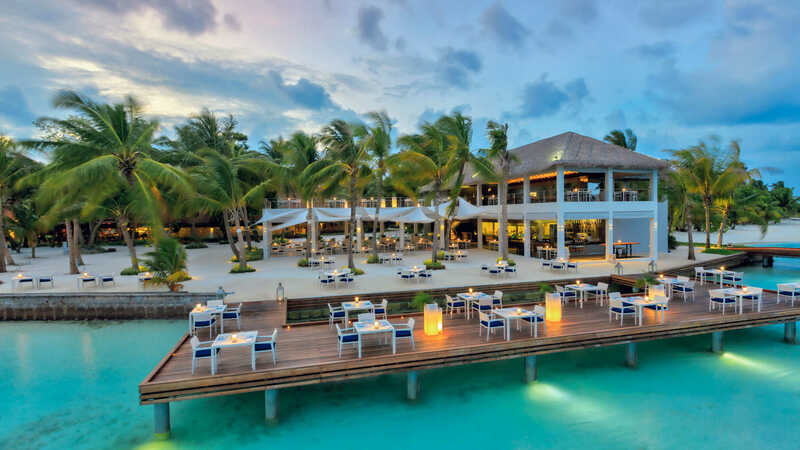 Kurumba Island is 48 acres and comprises of 180 rooms with nine different styles of accommodation ranging from the Royal Kurumba Residence, Deluxe Pool Villas, Beachfront Deluxe Bungalows and Superior Rooms (which would suit a large family’s as these can be adjoining). A 20-minute walk along the soft white sand will take you all around the island. After a 15-minute luxury Speedboat ride from Male airport, we arrived at the Islands Jetty and were greeted with a warm welcome, a bottle of chilled water and a portion of the islands home-made Coconut ice cream. We later found out the name Kurumba means ‘Little Coconut’ in the local language of the Maldives. We were staying in a Beach Front Deluxe Bungalow, and after check-in we were escorted to our accommodation in a golf buggy, giving us an opportunity to take in the initial ambience of this beautiful island. Our Beach Front Deluxe Bungalow was spacious and elegant, clean crisp white walls with timber furniture, king size bed with an extra-large ceiling fan that we found invaluable along with the air con and Wi-Fi. The lounge area boasted a large flat screen TV with satellite channels, a mini bar and complimentary bottle of fizz, along with a huge bowl of exotic fruits. Our terrace area had comfortable furniture. The large bathroom was in a private Asian-style garden setting and partly open air; on the back wall was a Monsoon rain shower for the indulgence of al fresco bathing, twin sinks set into a marble vanity top, alongside a walk-in shower and slipper bath. This had to be my favourite ‘hotel’ bathroom. The main pool is part of the central hub of the resort where sun loungers are neatly positioned between the giant canopies of palm trees giving welcome shade and the clear, fresh pool water is an inviting 27 degrees. The Kandu Bar serves the pool area and is sea-facing with luxury pods for that romantic seating, we enjoyed the fantastic cocktails offered by the bar, especially as we sited a pod of Dolphins as we sat there. The live entertainment programme is vibrant, with artists travelling from the mainland, we would like to give a shout out for the amazing drum band, a nod to the local culture. The multilingual waiting staff in this bar carried out their role with enthusiasm, nothing was too much trouble, they are a credit to the resort. There are eight restaurants offering a superb selection of culinary delights such as Vihamanaa Buffet, Hamakaze Japanese, Khing Thai, Thila Contemporary, Mahal Indian, Isola Italian, Al Qasr Middle Eastern, Cafe All Day Dining, Kandu Bar Athiri, and Fez. 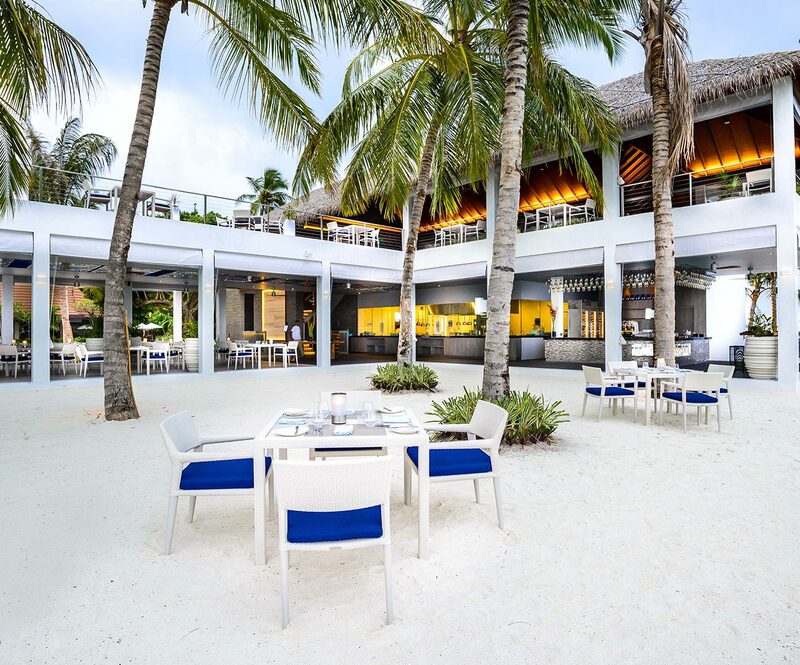 We dined at THILA, Kurumba’s signature restaurant which has won a selection of awards including the ‘Indian Ocean’s Best Restaurant’ award, two years in succession. I selected the Fois Gras with Brioche, Tomato Jam and Balsamic dressing, Australian Angus beef fillet (a generous mouth-watering tender piece of fillet cooked to perfection), my wife chose the catch of the day, two fillets of the freshest sea bass, drizzled with a sweet chilli and lemongrass butter, sea water cooked new potatoes, baby carrots and watercress purée. After the delights of the main course, we both settled for a portion of the “Lemon Pie”, a crisp citrus filling on a light pastry, there was no doubt in our minds just why this restaurant had won so many awards, to enhance the great experience was the expansive sea view setting and impeccable service. Veli refers to the word sand, which evokes a significant meaningful connotation combining elements of the sea with relaxing treatments in different styles, with the aim of connecting mind and body with nature. 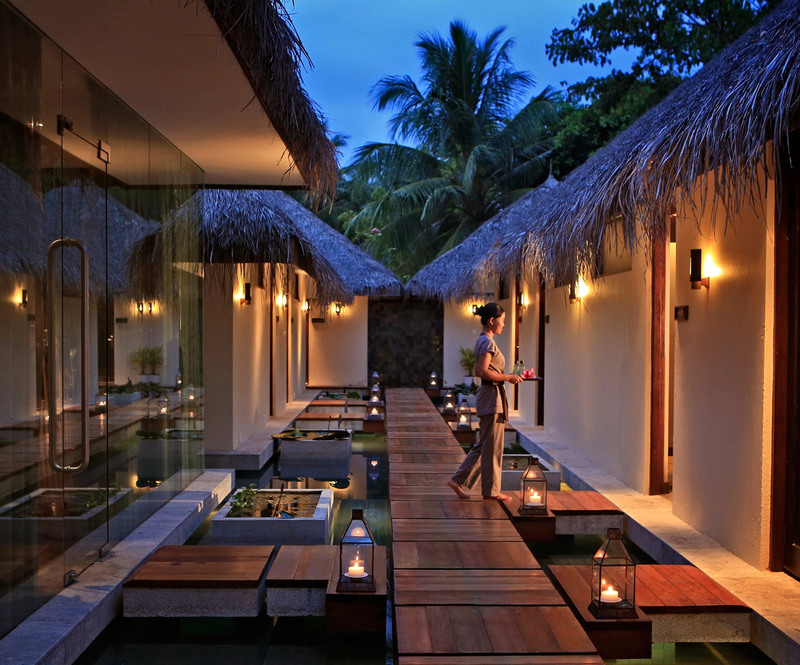 The treatment rooms lined a raised walkway over crystal clear water pools on either side with lush garden planters and large candle lamps illuminating the walkway. 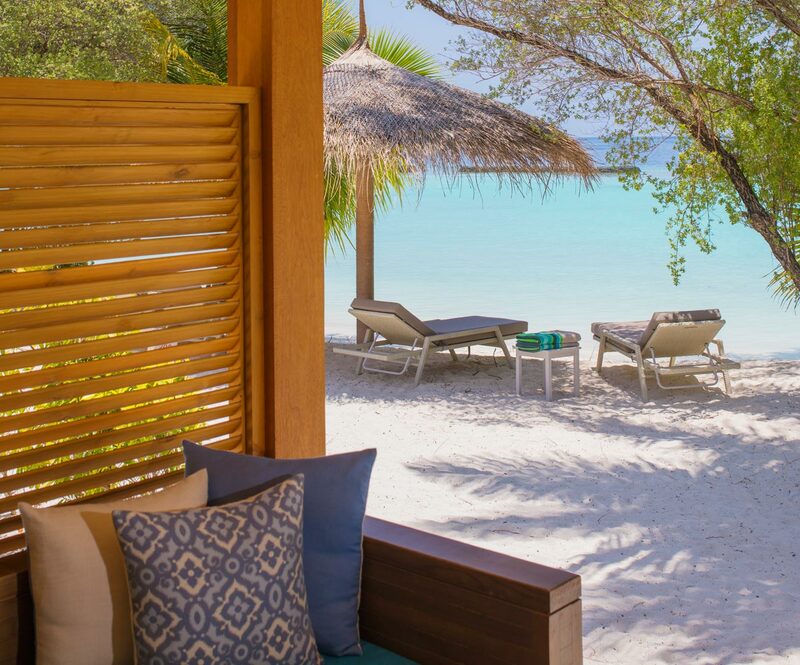 You can opt for a wide range of treatments such as Maldivian massages, outdoor massages, scrubs and wraps, facials, and manicure and pedicures. There are yoga sessions available with a wide range of styles available, you can also create a wellness package to suit your requirements. We booked and Aromatic Massage, which was described as ‘boasting healing properties using essential oils and therapeutic techniques’. We opted for the double treatment room and on our arrival, the massage technique was fully explained to us and after a short questionnaire, we were shown to our room where relaxing music played in the background. We thoroughly enjoyed our ‘pamper in paradise’, and the treatment had just removed that final little slice of stress that had followed us from home. We relaxed afterwards in a cool serene relaxation room with soft loungers, where a variety of teas and water were available to re-hydrate the body. Water sports and excursions are available and include para-sailing, organised sea cruises, a dolphin experience, and scuba diving (from novice entry level all the way up to dive master). Kurumba boasts a state-of-the-art submarine boat which has an underwater viewing window, giving an unrivalled insight into this fascinating world below the surface, colourful corals rising from the seabed having grown in situ for thousands of years and fish of all colours and size. One of the most popular activities is snorkelling, and as safety is a main priority, there are instructions available should you need it and each unit of accommodation there are life jackets provided, along with equipment to hire. We have since impressed our friends by telling them we have swum with sharks, but not mentioned they are the Grey Reef and Black Tip Reef sharks, less than a meter long and totally harmless, but awe-inspiring! Kuoni (01306 747008 or www.kuoni.co.uk) offer seven nights half board at Kurumba in a Deluxe Bungalow including flights on Emirates from London Gatwick and transfers in resort. The price for selected departures in May and June 2019 based on two adults sharing is from £1699 per person, with a saving of up to £944 per couple. Manchester Airport T2 Aspire Lounge prices start from £21.99 per adult.